"I wanted to say how impressed we were with your team, extremely hard-working and pleasant to have in the house. Craig and Ivan are brilliant representatives for your company"
Air-to-Air Heat Pumps let you use the natural heat in the outside air to heat the air in your home. They can help you to save on your energy bills and reduce your carbon emissions. Financial incentives are also offered by the government to encourage their uptake. The typical installation is electrically powered and consists of a wall mounted outdoor unit linked to an inside unit similar to an air conditioner. These units contain a refrigeration circuit that absorbs heat from the outside air before amplifying and distributing it to heat the air in your home. Many Air-to-Air Heat Pumps can also work in reverse to cool the air in your home as well. Planning permission is not usually required although this should be checked with your local authority. Multiple units can be installed when necessary and their relatively smaller size makes them particularly suited to apartments, smaller homes and conservatories. A key feature of an Air-to-Air Heat Pump is its ability to generate more energy to heat your home than is required to power its operation. Efficiencies of 300% can be observed with 1 kWh of electricity powering the pump generating 3 kWh of energy to heat your home. 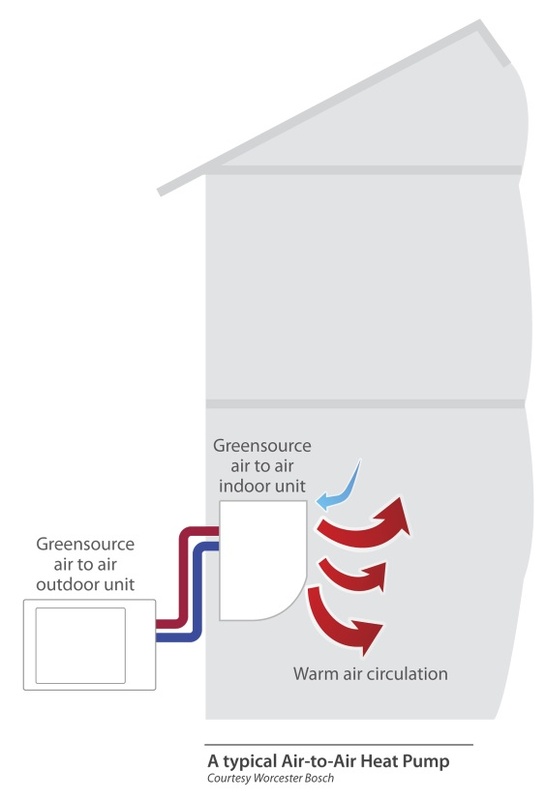 Air-to-Air Heat Pumps are more likely to be a good choice if your home is well insulated. Good levels of roof, floor and wall insulation are all desirable as are double glazed windows. Installing an Air-to-Air Heat Pump can help you to reduce your monthly energy bills depending on your current system and the other options open to you. Savings are more likely if you do not have access to mains gas. Savings are unlikely to be possible if your home is not well insulated. The table below identifies the savings that the Energy Savings Trust suggests might be made by replacing an existing heating system with an air source heat pump in an average detached 4 bedroom home. Find out more about these figures. Unlike Ground Source and Air-to-Water Heat Pumps, Air-to-Air Heat Pumps are not an eligible technology under the government’s Domestic Renewable Heat Incentive scheme.